Being caught in the dark during an emergency is never a pleasant feeling; in fact, it can be a true danger. But most flashlights are weak, and barely illuminate the immediate area; they certainly can't be used for signaling. The best solution? A tactical ​LED flashlight! This is a powerful tool that you will come to love as something vital for many situations. But what is the best tactical flashlight? What to look for in a tactical flashlight? The PeakPlus Super Bright LED Tactical Flashlight has five lighting options, including an SOS and strobe function. It's water resistant, anti-abrasive, and skid proof. 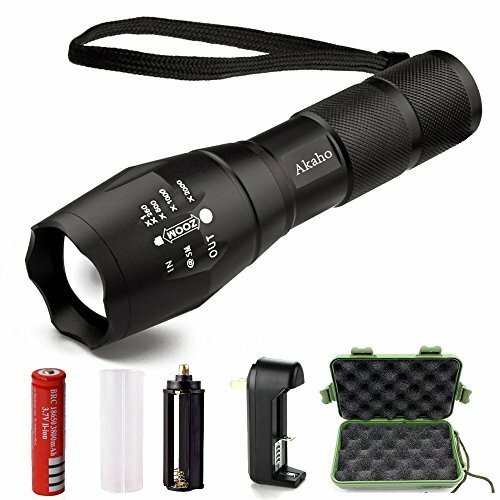 The Akaho 900 Lumen XML T6 Tactical Flashlight is a durable one, made out of aluminum. It has five light modes, including an SOS option, and is both waterproof and shockproof. 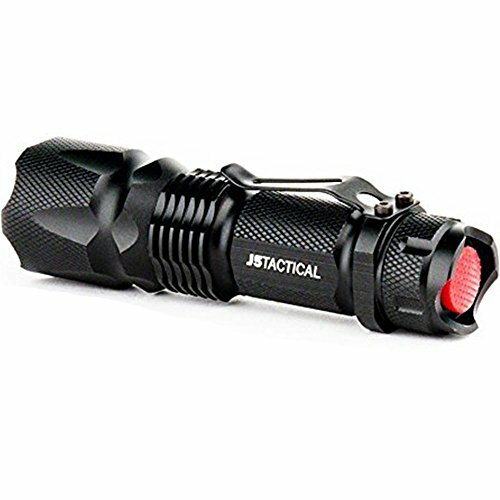 The J5 Tactical V1-PRO Flashlight is very durable, made out of tough aluminum alloy. It offers three light options: high, low, and a strobe function. Its LED light puts out 300 lumens. The ONSON 900 Lumens Outdoor Waterproof Tactical LED Flashlight is a great tactical flashlight. It's made out of aluminum, and is completely waterproof and shockproof. There are five different lighting modes, including a strobe and SOS option. It puts out 900 lumens, for a very bright light. The AYL TF89 Bright 900 Lumens CREE XM-L2 is made out of aluminum alloy, for a stronger, tougher body. There are three different light functions, including a strobe option. This flashlight is both waterproof and weatherproof for outdoor use. As far as tactical flashlights go, this is a fairly common one. There aren't very many problems with it; it functions quite well. It just happens to be very run of the mill and common. Perhaps its best feature is the five light modes that it offers. You can choose between high, medium, and low, for basic lighting; or you can choose the strobe or SOS option, for signaling for help. The body is strong, durable, and shock-, skid-, and water-resistant. However, it isn't waterproof or shockproof, so you may have to be a bit easier on this particular light. The biggest problem with the PeakPlus Super Bright LED Tactical Flashlight is that the lens has been reported to fall out at times, leaving this product absolutely useless. Has 5 different modes: high, medium, low, strobe and SOS. Can also run off of a single AAA battery. Some customers have reported lenses falling out. The Akaho CREE XML T6 Flashlight is a good option when it comes to a tactical flashlight. Its problems are few, and it has everything that you could ask for in a tactical flashlight. This flashlight is constructed of aluminum, making it a strong, sturdy option, perfect for outdoor use. It also means that it is virtually shockproof; you don't need to worry about dropping it. 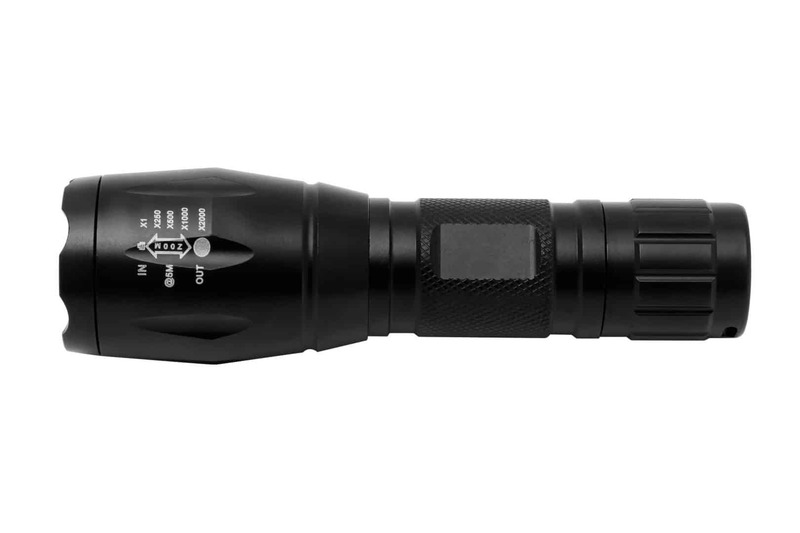 The Akaho CREE XML T6 Flashlight also comes with five different modes for different times. There are the standard high, medium, and low options; there is also a strobe and SOS setting available, for signaling. The only complaints that could be found were a few scattered reports of the flashlight not having the options it claims, and the occasional product failure. Other than that, this appears to be a great tactical flashlight for you to choose. Very bright light (900 lumens). Durable aluminum made, perfect for outdoor use. Has 5 modes, including strobe and SOS options. zoomable design for better viewing. In some flashlights, the modes don't work properly (the flashlight only turns on and off. There have been some cases of rapid product failure. The J5 Tactical V1-PRO Flashlight is a good choice for you to make. It can certainly get the job done, though it isn't as easy to use as other tactical flashlights. The body of this flashlight is made out of aluminum alloy, which is strong and sturdy enough to use outdoors and in adverse weather conditions. The lens, too, is strong enough to avoid being damaged if the flashlight is dropped, something that is great in less-than-stable situations. It has three different light modes: high, low, and a strobe setting. This is a good basic option, because it allows you two different forms of steady light, and one that can signal. It does not have an SOS option. The rechargeable battery that it would do best to run off of, however, is not included with the product. It can run off of a single AA battery, but that also isn't included. Has a 300 lumens LED light for the brightest, longest-lasting light. Made of aluminum alloy, making it strong and durable. Three light options: high, low and strobe. Rechargeable battery not included, though it can run off of a single AA battery. One of the best options available in a tactical flashlight is the ONSON 900 Lumens Outdoor Waterproof Tactical LED Flashlight. 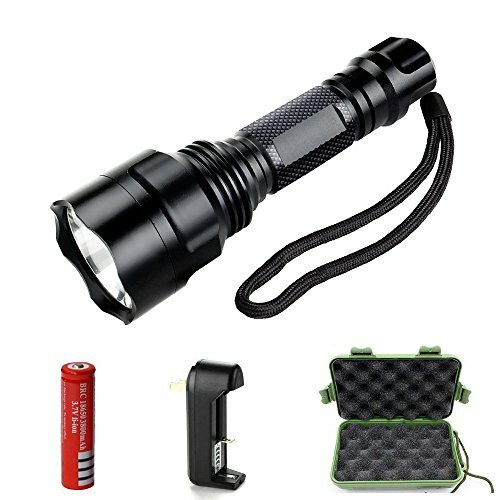 This flashlight has hardly any flaws, and works quite well in use, while being easy to maintain. The most important perk of using this tactical flashlight is the different light modes. There are five: high, medium, low, strobe, and SOS. The first three are great, because they offer you more than one option in standard lighting. The last two are perfect for signaling for help, or just making your presence known. The body, too, is a very durable one. Made out of aluminum alloy, it is both waterproof and shockproof. This makes it a great option for outdoor use, and for use in emergencies. This is a flashlight that is easy to care for. There are no changing batteries here; simply recharge the lithium battery, and you're good to go! The only downside that we could find were concerns that the case the flashlight comes in is cheaply made. Other than that, this product appears perfect. Made out of durable aluminum, making it great for outdoor use. Completely waterproof and shockproof, for use in adverse weather conditions. Emits 900 lumens, for the brightest light possible. Has five different light modes: high, medium, and low, as well as a strobe and SOS. The storage box seems cheaply made. The AYL TF89 Bright 900 Lumens CREE XM-L2, on its surface, appears to be a good tactical flashlight, but it has some problems. The biggest problem is that this product has been reported to suddenly fail, and will no longer hold a charge. Though this isn't as common a problem as others, this is a very dangerous one; your emergency light might not work at all in an emergency. The lens is made out of rather soft plastic, making it far from shock- and shatterproof. There are also no instructions, and no SOS mode. There are positives, though. It is waterproof and weatherproof, and the light is indeed very bright. Made of anodized-aluminum alloy, for a tough body. There are three different modes to choose between: high, medium, and a strobe function. There are no clear instructions included with the product, making it difficult to use. There have been reports of products no longer charging, rendering them useless. The lens is made of a soft plastic, instead of a sturdier option. 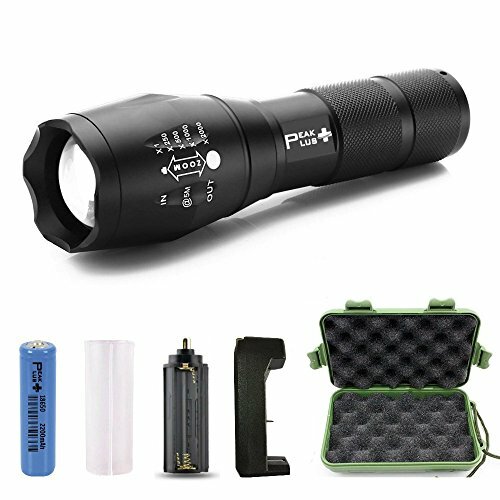 A tactical flashlight is a flashlight that is designed to be used in very adverse conditions, or that can be used when a lot of light is needed. This makes it perfect for activities such as hiking, camping, or just in the event of an emergency situation. Tactical flashlights also, in general, have a longer battery life than a standard flashlight. This is to prevent you from reaching for your light, only to find that the battery is completely drained; a dead flashlight in an emergency isn't any good, after all! You'll also find that most tactical flashlights have multiple settings, to determine the type and amount of light that you'll get when using it. There is usually a high, medium, and low setting, as well as a strobe setting; some even come with a setting that will flash SOS. They are also normally waterproof. This makes it especially good for extreme situations; you don't need to worry about getting your flashlight wet! You also don't need to worry about replacement batteries. Tactical flashlights are rechargeable, and hold a charge for a long time. Tactical flashlights have many uses, and are normally far more practical than the standard flashlights that most people have. Because they are stronger and have more settings, this makes it a highly-specialized tool. If you are an avid hiker, camper, or hunter, you shouldn't leave home without taking a tactical flashlight with you. Because the dark can be so treacherous in these scenarios, a bright light is an absolutely vital part of your equipment. Tactical flashlights are also a definite must-have for your emergency preparedness kit. Because many emergencies and disasters involve loss of power (and thus, lights), a good, reliable way to see in the dark is a need that you can't afford to be without. It's also a good idea to have a tactical flashlight in your vehicle, in the event of an engine problem, flat tire, or accident. It makes it far easier to survey damage and to fix problems than relying on small, less powerful flashlights. The answer? Almost certainly, yes! Tactical flashlights are far superior to the plain flashlights that most people keep in their homes. They offer more power, more settings, and, because of this, are better to keep on hand. They make excellent choices for your emergency kit, or your camping gear. Keep it in your vehicle for on-the-fly repair work, such as changing your ties, or just keep one at home, in case the power goes out during a storm. It's best to purchase multiple tactical flashlights. Try to keep one anywhere that you will likely need a flashlight: at work, at home, in your car or your backpack. Whatever you do that requires light in the dark, you can be certain that a tactical flashlight will always be an asset. Whether you're planning to take it with you into the wilderness, or simply want a way to navigate your home in the dark, you can use a tactical flashlight. Because tactical flashlights are so powerful, you'll want to know exactly what to look for when purchasing one. That's where we come in! A tactical flashlight generally has multiple settings, to allow for quick customization and for more varied usage. This is definitely a plus for those in extreme or survival situations. There are the standard settings that almost every tactical flashlight has: high, medium, and low. It allows you to shine just enough light on the situation, or to turn up the brightness to better illuminate the problem. There is also normally a strobe option available for tactical flashlights. This is useful for a number of situations; it can be used to call attention to yourself while cycling, to alert searchers to your location, or to mark your vehicle as in distress. Lastly, you'll find that some tactical flashlights even come with a setting that will flash SOS. This is particularly useful for those who are going to be in remote areas; it will allow you to flash the request for help that is best known. After carefully examining all of the flashlights on this list, we have determined that the best tactical flashlight is the ONSON 900 Lumens Outdoor Waterproof Tactical LED Flashlight. This is the most promising, most powerful, and easiest to use. It has the five light modes that you can expect from a good tactical flashlight, including an SOS mode, which is perfect for emergency situations. It also has a range of lighting capabilities. The body itself is very strong, made out of aluminum alloy. It is shockproof and waterproof, which makes it great for the outdoors and bad weather usage. The fact that the only complaint that could be found was that the product's carrying case was cheaply made says a lot about the product. The ONSON 900 Lumens Outdoor Waterproof Tactical LED Flashlight truly is a great choice in a tactical flashlight.